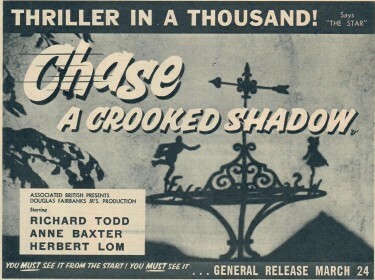 The Picturegoer Magazine of March 29th 1958 had Two full pages really whetting our appetites for what we would shortly be able to see at our local Cinema. A bit like ‘Coming Shortly’ in between the Big Picture and the Supporting one – when the film trailers came on – I used to love that. One of those above was Chase a Crooked Shadow with Richard Todd, Anne Baxter and Herbert Lom. 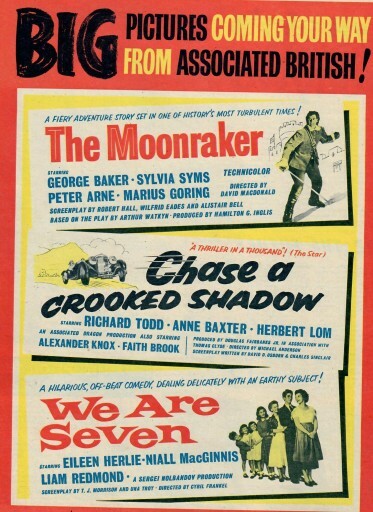 I remember seeing this film at the time – and again some time later. It had quite a twist at the end a very surprising one – but I wondered if. once you had seen it, the impact of the film would have gone. However thinking again, that can’t be true because The Mousetrap – that long running thriller – relies on a twist but I have been back to see it a number of times – in fact early this year at The St Martins Theatre in London’s West End was the last time. 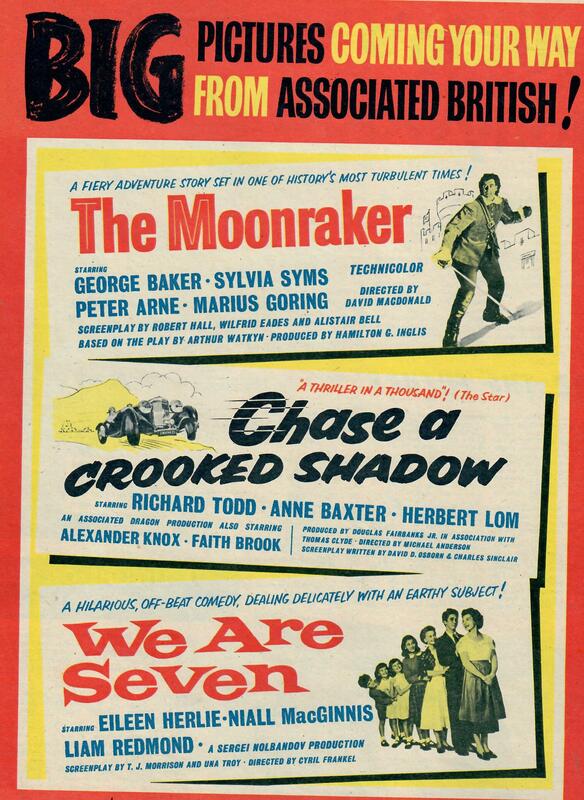 As for The Moonraker with George Baker and Sylvia Sims, that was on Television recently and I watched a lot of it including the famous climax filmed at Durdle Door in Dorset – close to Lulworth Cove. 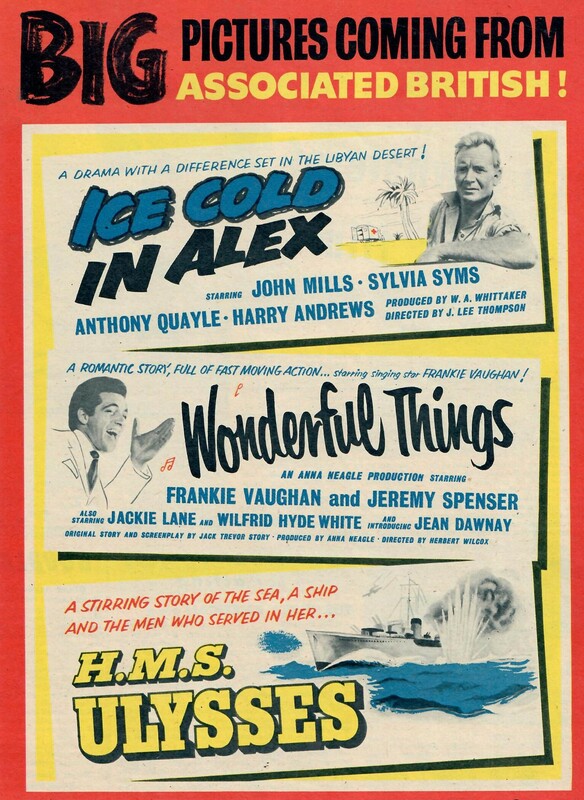 Some great films on offer here though – Ice Cold In Alex we all know well but I am not so familiar with Frankie Vaughan in Wonderful Things or HMS Ulysses. 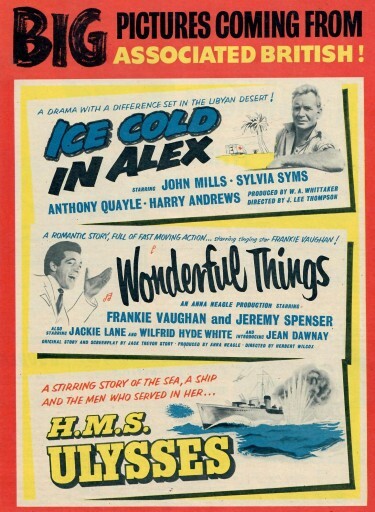 Frankie Vaughan though had quite a film career – first with ‘These Danerous Years’ followed up with ‘The Heart of a Man’ which I remember seeing. Then he went to Hollywood to appear with Marilyn Monroe in Lets Make Love.